In Tigrai Minilik is a villain, Alula a hero, Isaias a feared mad man, Gedu a thief, Abiy a traitor, Meles a visionary, and Debretsion 'nayna'. In Eritrea, it is the opposite, we don't really know much about Minilik, it is Alula who is the villain, Isaias the hero, Abiy a visionary, Gedu a friend, Meles a con artist, and Debretsion a common thief. How can you reconcile this two opposite pictures of the same reality? This will the biggest hinder as Tigrai tries to befriend Eritrea. Tigrai cannot keep its narrative and still be on friendly terms with Eritrea. It cannot keep either the stolen lands and stolen wealth and hope to be on friendly terms with Ethiopia. It is as Gen. Sebhat Efrem said, the actions that the TPLF took during the past decades have instilled a deep hatred of anything related to the TPLF (Tigray unfortunately is getting swept up in all this) for generations. Their only hope is to throw out the TPLF and make amends with the people of Eritrea and more importantly their Ethiopian brothers and sisters. we don't really know much about Minilik, it is Alula who is the villain, Isaias the hero, Abiy a visionary, Gedu a friend, Meles a con artist, and Debretsion a common thief. For your information, Menelik is the one who sold you to the Italians. And the "con artist" is who signed the independence of "SingaPoore". LOL! Brother justo touched agameW’s nerve with truth. Defense Force contingent is detained in Tigray again; this time in Shire. Convoys ordered to park at the stadium in the city. 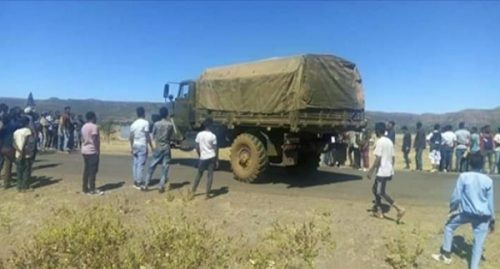 A contingent of Ethiopian Defense force was blocked in Shire, Tigray, today as it was trying to move away from the region. Residents of the town blocked streets with big rocks and a number of Ethiopian Defense force convoys were made to enter the town’s stadium. While the soldiers were moving with orders from Ethiopian government, and while it was residents, allegedly, of Shire town that blocked the mobility, it remains unclear as to who made the arrangement, and/or ordered, for defense force convoys to be parked at the stadium. It happened for a second time in less than a week. Last week, soldiers and their commanders who were ordered to remove heavy weaponry from Zalambessa, https://borkena.com/2019/01/01/zalambes ... he-region/ a border town between Ethiopia and Eritrea which was closed by Eritrea on grounds of need to regulate cross border commerce and movement, were blocked. Despite the blockade, the soldiers were ordered by government not to use force to open up the blockade and government representatives had to hold discussion with residents before the force was allowed to move towards the direction of its destination. Residents in the region allegedly raised security concerns that Tigray might be attacked if the border is left undefended. Prime Minister Abiy was asked about it when he had a meeting with teachers from across the country last week. He said people in Tigray have every right to ask what government is doing and Ethiopians would respond if there is any attack against Tigray. But, he continued, it is not right they blocked the mobility of forces as government is the only entity that has an absolute power to move around soldiers on the basis of security and defense needs. Deputy Chief of Staff of the Defense force, Let. Gen. Berhanu Jula was also asked about the blockade today at the Ethiopian Parliament, where he appeared to present performance report of the defense force. A parliamentarian used Amharic word with a meaning close to “detainment” to describe the situation of Defense Force incident in Tigray. But the Deputy Chief of Staff was not too happy about it. He also noted that the action does not have recognition from the regional state of Tigray. Political pundits in the opposition, and social media activists alike, seem to think that the incident in Zalambessa and Shire is orchestrated by a TPLF faction that lost power in the central government and the objective of organizing blockage of the defense force was to create a serious political tension between people and government. Some even go to the extent of claiming that subversive forces within TPLF, and they are believed to have the upper hand in the regional state power relation, were even ready to make a video after the expected clash between Defense force and the people, which never happened. Minilik cannot sell something that he didn't own. It was the thief Alula who thought he owned Eritrea, just like the thief Meles thought he owned Wolkait and Raya. Minilik just said, oh, these Eritreans, they seem to be a very nice people, oh, how I wish they were my people, but unfortunately they are not. I wish the Tigrais were not my people, but unfortunately they are. I have Tigrai and Ethiopia to worry about, so if the Eritreans want to fight the Italians, they should do it themselves. Now look at the miles upon miles of lush beaches that belong to Eritrea, fully acknowledged by Minilik for eternity, so if you ask me, Minilik should be considered a hero in Eritrea unlike the scoundrel Alula. I hear you! I like your explanation a lot. He saved some part of Africa by uniting tribes using arms he acquired from Europe but, wasn't a superman to save all Blacks in the rest of the world.